Leicester-based Jessops, which has been on our high streets since 1935, has gone into administration, the first big name to go under in 2013. Restructuring firm, Hilco UK, is in discussions with the administrators of Jesspos, Pricewaterhouse Coopers (PwC), about buying the brand. PwC has already closed all of the Leicester-based chain's 187 shops with the loss of 1,370 jobs. Reports are suggesting Hilco UK is considering opening Jessops concessions in HMV stores, which the group have bought this week. Leicestershire Chamber of Commerce says it was surprised by how quickly the Jessops photo shops were closed down. Administrators for the company were called in last week, with all branches closing two days later. Nearly 1,400 staff are losing their jobs, including those working at the company's head office in Leicester. John Willats reports. The camera chain went into administration last week and closed all 187 of its stores in the UK as well as 20 in the Midlands. But the Leicestershire chamber of commerce says the city has performed better than expected during the recession. Workers of Jessops who seek advice should contact The Retail Trust. A charity that helps people in the retail sector says a quarter of the calls to its helpline in the last week have come from former Jessops employees. The Leicester-based camera company went into administration last Wednesday but on Friday the administrator closed the firm's 187 shops, including 20 in the Midlands. The firm is based in Leicester and started in the city in 1935. Now the Retail Trust says it can provide help and support to 1,300 staff who lost their jobs. A Jessops store in Birmingham has placed a sign in its window informing customers that the shop has now closed. The national chain announced yesterday that the company had official gone into administration leading to the loss of 230 jobs in the Midlands. The group, which has had its headquarters in Leicester since 1935, has suffered from online competition and the boom in camera phones in recent years. "We're hugely disappointed but we also recognise that the business was in great difficulty and was adversely affected by internet trading. Unfortunately for Jessops, the ability to buy cameras online has had a dramatic impact on the firm." Leicester-based Jessops is closing all 187 of its stores across the UK. Administrators made the announcement this afternoon. More than 1300 jobs across the country will be lost - 230 of those right here in the Midlands. And more are likely to go at the group's head office in Leicester. Our Business Correspondent Mark Gough reports. Can't believe #Jessops is to close.. Was a good place to work.. My first retail job when I was 16.. Feel sorry for friends losing jobs.. Very sad about #Jessops closure tonight. They have looked after me well over the years, always has great customer service. Such a shame. Some 2000 jobs have been put at risk as camera chain Jessops became the first retail casualty of 2013, with store closures "inevitable". 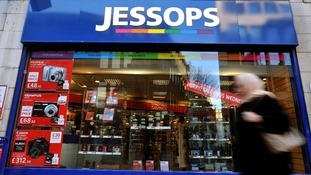 Jessops looks set to become the first high street casualty of 2013 as the retailer is understood to be on the brink of administration.